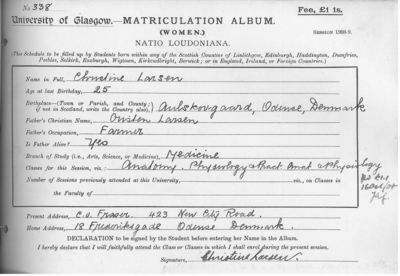 Christine Larsen enrolled at the University of Glasgow for one year in 1908, aged 25, to study Medicine. She was one of three Danish women who came to study Medicine at the University that year. Together with Julie Elise Hoffman and Agnes Rothe, Larsen was among the first Danish women to have attended courses at the University. Larsen was born in Avlskovgård, Odense, Denmark, daughter of Onsten Larsen, a farmer. She studied Physiology and Senior Anatomy, and was awarded a second class certificate in her Physiology class.